The Large Magellanic Cloud photographed using a small telephoto lens and a modified DSLR camera to highlight the molecular clouds. Credit: Andrew Lockwood. 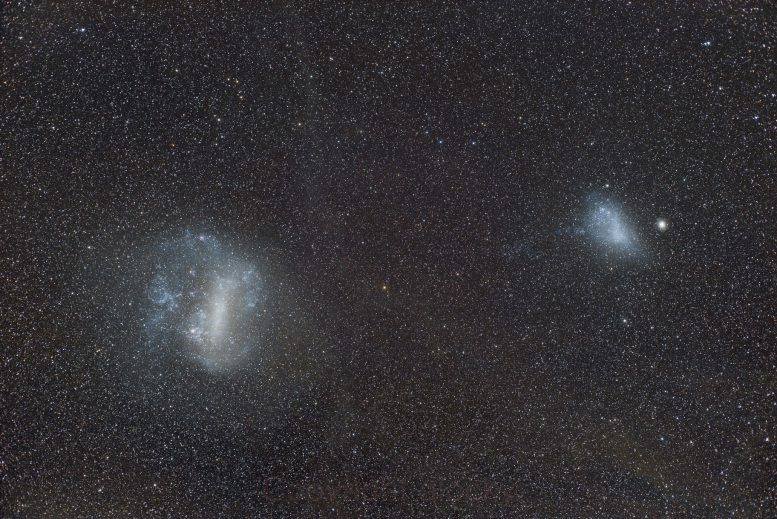 Astronomers believe two of the closest galaxies to the Milky Way—the Large and Small Magellanic Clouds—may have had a third companion. Research published today describes how another “luminous” galaxy was likely engulfed by the Large Magellanic Cloud some three to five billion years ago. 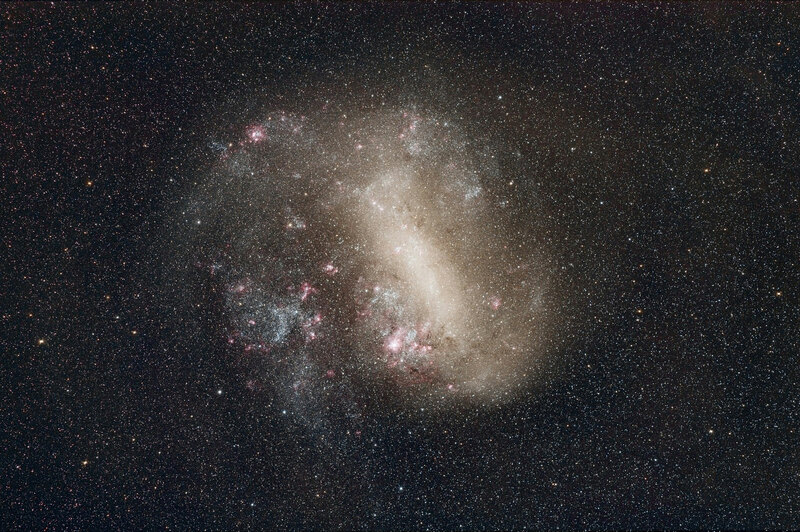 ICRAR Masters student Benjamin Armstrong, the lead author on the study, said most stars in the Large Magellanic Cloud rotate clockwise around the centre of the galaxy. But, unusually, some stars rotate anti-clockwise. Stars in the Large Magellanic Cloud (blue) and a counter-rotating dwarf galaxy (red) as they merge over 1.4 billion years. The direction of rotation for each galaxy has been highlighted by a selected star (yellow). Ben Armstrong, ICRAR/UWA. The Magellanic Clouds can be seen in the night sky with the naked eye and have been observed by ancient cultures for thousands of years. The Large Magellanic Cloud is a relatively small 160,000 light years away from us, while the Small Magellanic Cloud is around 200,000 light years away. Mr Armstrong said the finding could help to explain a problem that has perplexed astronomers for years—why stars in the Large Magellanic Cloud are generally either very old or very young. This is known as the ‘age-gap’ problem, Mr Armstrong said. “Because in the Large Magellanic Cloud we see star formation starting again, that could be indicative of a galaxy merger taking place,” he said. The Large and Small Magellanic Clouds. Credit: Andrew Lockwood. Mr Armstrong said the finding could also help explain why the Large Magellanic Cloud appears to have a thick disk. “Our work is still very preliminary but it does suggest that this sort of process could have been responsible for the thicker disk in the past,” he said. Mr Armstrong said the research was about asking pertinent questions that astronomers could start examining. “It’s about creating a new idea, a new way of looking at an old problem,” he said. Paper: Formation of a counter-rotating stellar population in the Large Magellanic Cloud: a Magellanic triplet system? Be the first to comment on "Large and Small Magellanic Clouds May Have Had a Third Companion"